GeoTargeting, within CAKE, is the ability to accept country-specific traffic to an Offer or Offer Contract. As a quick example, you may only want to accept click traffic to an Offer from Australia. GeoTargeting allows you to apply this rule. Geo & Rules targeting behaves differently when redirecting from one offer to another offer vs. one offer contract to another offer contract on the same offer. Example: You have an offer that supports US/CA/UK, and you want to track every country separately because you're receiving a different price received for each country. PROS: Your affiliates can see all the different countries in the Affiliate portal and run only the ones they would like to. Every Offer can have it's own separate set of Creatives, Preview Links, Description and some other elements as well to differentiate the varying countries. CONS: You have to set up and manage 3 different offers which means having 3 pixels placed by your advertisers. Because you're counting on CAKE to auto-create the campaigns as needed, if your affiliates wanted to place different pixels for each country you would have to create all 3 campaigns in advance. In the example above, the Offer is allowing traffic from the US. This is indicated by the green dot in the Allowed column. To allow a country, select the name of the country and then click on the Allow Selected button. Traffic from the United Kingdom, however, it now allowed. This is indicated by the red dot in the Allowed column. However, we have identified a Redirect Offer in the Redirect Offer column. This means that UK traffic will redirect to this Offer and the Affiliate will be paid for any potential Conversion if the Paid Redirect feature is enabled on the Campaign card. 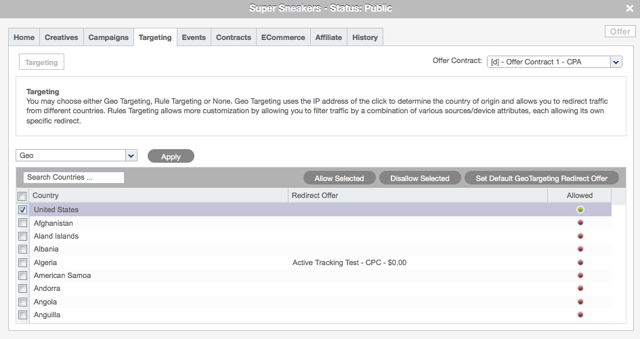 This setup allows you to accept traffic from varying countries, but manage the traffic through various Offers. Even though the idea is that your affiliate will only be trafficking the main contract, you should apply geotargeting on all contracts. 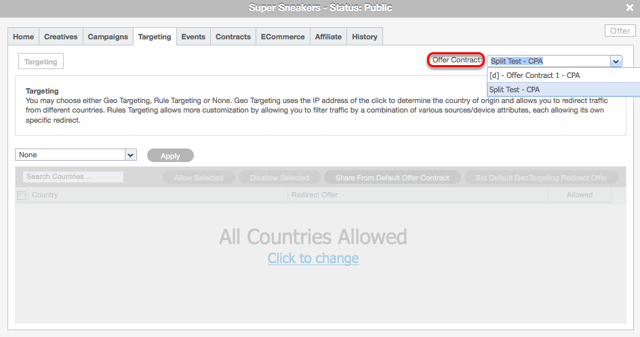 Once you allow a country, such as the allowed country above, the list of Offers in the Redirect Offer drop down will be limited to Offer Contracts for this Offer. As traffic is sent to the Offer, CAKE will determine which Offer Contract to redirect the traffic to based upon the allowed country. CAKE will auto-create a new Campaign for the Affiliate as the redirect occurs. It's important to note that the new Campaigns will be Non-Original, but will NOT require exceptions. What if I set up a waterfall effect with the geotargeting like this? Will that work? Unfortunately, no. With contracts we assume that when you told us to go from 1 contract to another, that country (or rule) is meant to go to that contract so CA traffic was sent to the default contract, we would track that under the UK contract (even if there is a rule set up saying it should go to the CA contract). We will not look up the geotargeting rules on a secondary contract so you need to be sure that you've set up your targeting correctly so that all conditions are accounted for on the contract that the traffic is going to. How is GeoTargeting with rules different than GeoTargeting? There is one main distinction of GeoTargeting with Rules, compared to GeoTargeting on its own. It's important to note that you can only use Geo OR Rules so if you have ANY conditions that you want to target on beyond country-level targeting you must use rules.